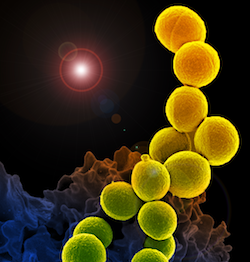 ■ Scanning electron microscopic (SEM) image showing yellow methicillin-resistant Staphylococcus aureus (MRSA) bacteria. Image courtesy US NIAID. The possibility of anti-bacterial and disinfectant products promoting the spread of so-called superbugs is often discussed, but so far the scientific evidence suggests this is not not happening. These products have been in use for many decades, and linking them with the evolution of bacterial infections which are resistant to a range of antibiotics is based mainly on fear and confusion. ‘Superbugs’ is just a popular term for new strains of bacteria, such as MRSA, that are becoming more resistant to some antibiotic medicines, such as penicillin. There is no official definition, but the US Centres for Disease Control monitors and classifies the treat of such bacteria as either urgent, serious or concerning. Antibiotics have been with us since the 1940s, and should not be confused with anti-bacterial cleaning products or their ingredients - they are totally different. The spread of antibiotic resistant ‘superbugs’ is a serious problem, because when someone becomes infected the doses of many antibiotics that it’s safe to give them no longer clear up the infection. Most experts agree the reason for the spread of superbugs is the overuse and abuse of antibiotics, and it’s very important that all of us now use precious antibiotics more selectively and wisely. Scientific evidence indicates that anti-bacterial products, disinfectant and antiseptics do not lead to antibiotic-resistant bacteria, despite many decades of use, and that’s it’s unlikely to happen. Despite widespread about a possible link, these products kill superbugs just as easily as ordinary bugs. Halting the evolution and spread of superbugs like MRSA is a huge challenge for us all. 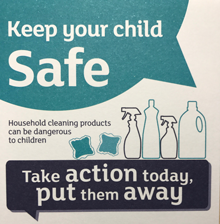 Health authorities recognise that good hygiene to prevent people developing infections in the first place is now more important than ever. 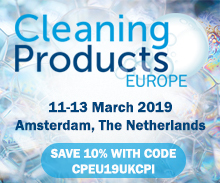 Effective antibacterial products, disinfectants and antiseptics that we can use to stop the spread of germs, including superbugs, are now even more valuable as part of a targeted hygiene approach. To read more about this issue, we recommend the experts on home hygiene, the IFH.